Some years ago I spent a year working as a press officer in the criminal justice system and was heavily involved in the press briefings for a case in which a child had been murdered by another, slightly older, schoolmate. It was disturbing yet fascinating case but despite everything - the older boy had deliberately lured the younger one to his house before killing him, then hid the body before getting on with homework - I found it very hard to see the killer as an inherently evil monster, and the scowling, acne-scarred mugshot all over the local press, bore almost no resemblance to the frightened, bewildered and desperately sad young boy I saw in the dock. I've been interested in the way society views child criminals ever since, which was what prompted me to pick up this book. 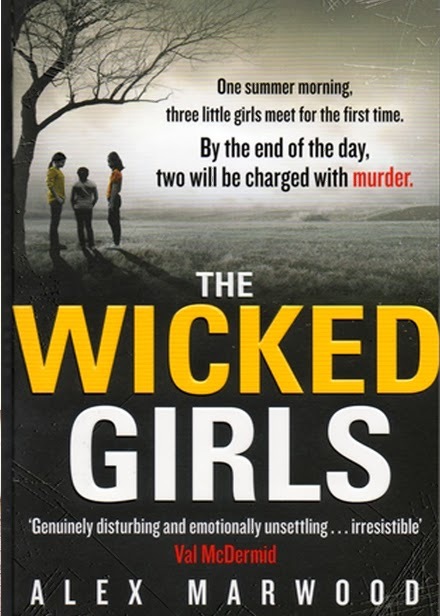 Alex Marwood's The Wicked Girls centres around two women, Amber and Kirsty, who, aged 11, were found guilty of abducting and murdering a small child, and last saw each other on the day they were convicted. Now in their late 30s, they have long-established identities and have built themselves new - but very different - lives. Only when their paths cross by coincidence during a spate of murders in Whitmouth, a rundown fictional seaside resort on the south coast, do their second chances threaten to melt away. There are three plot threads running through this dark, contemporary suspense novel. First, there's the matter of the serial killer apparently on the loose in Whitmouth, where Amber lives and where Kirsty is covering the story as a freelance journalist; second is the story of both women's ever-present fear of having their pasts discovered. The third, told in flashback, is the story of the terrible day in the mid-80s when Amber and Kirsty, under their old names, met for the first time and killed a four-year-old girl, making for unsettling but revealing and all too plausible reading. For me, the serial killer story is actually the weakest of the three. It sometimes seems to be present purely as a means of shoving Kirsty and Amber together, and I also guessed fairly early who the 'Whitmouth Strangler' would turn out to be. That said, the novel's focus on the media coverage of the Whitmouth murders is interesting and insightful (Alex Marwood herself is a journalist writing here under a pen-name) and this part of the book also supports one of the book's principal questions: how well do we really know the people closest to us? The Wicked Girls is let down just slightly by what seems to me to be slightly lazy stereotyping of supporting characters: the stalkerish, anorak-wearing loner, the dark-haired 'handsome brute' type who charms all the girls in the fairground, the cold-hearted businesswoman, the middle-class husband who resents his wife's career. Given that the book is partly about confounding expectation and the dangers of taking people and situations at face value, I didn't feel this pre-fabricated approach to character development sat particularly well in what is otherwise a shrewdly perceptive narrative. However, the only characters that really matter are the wicked girls themselves, Kirsty and Amber, and Alex Marwood has done a great job with them. I don't find it entirely plausible that Kirsty would have chosen news journalism as a career, given her circumstances, but this is a small matter and not one that worries me a great deal. Overall, Kirsty and Amber are complex and occasionally, as real people are, surprising ,and their story is a thought-provoking and gripping one.